build skills to support change in our communities, working with service providers, youth, and others. Demand for our workshops, trainings and public talks has been greater than we expected, and continues to grow. As a result, we need to re-imagine the program in order to be able to meet the need from within our existing capacity. Our ability to offer programming during the restructuring period is limited, but we will be back with an effective and sustainable offering soon! Stay tuned. The Navigator works with vulnerable populations and communities including marginalized identities to reduce barriers and improve access to services and support after experiencing sexualized violence. 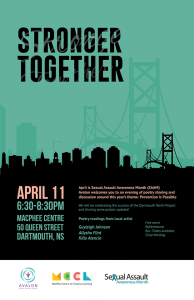 The Dartmouth North Project grew out of a need to address institutional barriers and other factors that limit community efforts to prevent and reduce violence against women and girls in identified high-risk neighbourhoods. With a focus on female youth between the ages of 12-25 living in Dartmouth North, the project provided an opportunity for community residents to work together to mobilize the community around issues pertaining to addressing violence against women and girls. With consultation from the neighborhood, a needs assessment was conducted and provided an in-depth look at the climate of the community around issues related to sexual violence. The needs assessment provided an opportunity for community residents to participate first hand in being apart of the solution towards addressing the issues in the community. The community was involved in identifying strategies to address violence against women and girls. The coordinators were responsible for working with the community to implement the strategies. This project, funded by Status of Women Canada provided the opportunity for Avalon Sexual Assault Centre to work with organizations and community members in Dartmouth North to address systemic barriers that lead to violence against women and girls. Robyne Gorman and LaMeia Reddick, both life-long residents of Dartmouth North were hired as the coordinators of the Dartmouth North Project. Both LaMeia and Robyne brought a lot of knowledge and passion to the project. Barriers to community collaboration (lack of communication, awareness of programs/services, duplication of programs/services. More involvement with the schools in the area. Service providers could facilitate programs during or after school hours and evening programs. Community collaboration between service providers and community members should be strengthened. Service providers should look at how easy they are to be accessed, like hours of operation, location, cost, and lack of specific services. Service providers should move towards a trauma-informed model of care. The Capacity Coordinator worked with various community groups to build their capacity to respond to the needs of survivors of sexualized violence. The Capacity Coordinator responded to community requests for professional development training or initial response training. They also worked to build community partnerships with other organizations across the province, to support organizations in responding to the needs of survivors of sexual assault while also building the capacity of Avalon to respond to the needs of different marginalized groups.